Why is This Man Still on Twitter? During his time on Instagram, Ramzan Kadyrov, the Kremlin-backed Chechen strongman, became a minor social media phenomenon as he sought to promote a cult of personality centered on himself. 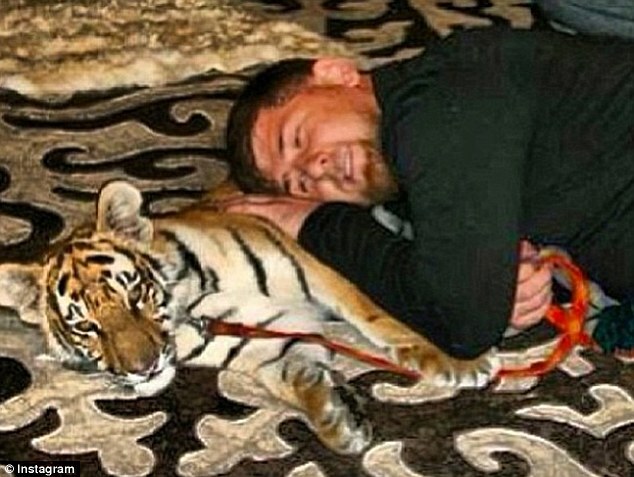 He posted frequent workout videos featuring himself and his gym partners, shots of himself snuggling various exotic animals, and promoted the Chechen mixed martial arts scene. Kadyrov, who rules Chechnya with an iron fist, has also allegedly had journalists and civil society activists in the region killed. Last year, he made the news for reportedly having authorities round up and torture gay men. On Dec. 20, he also became one of five new Russian citizens to face sanctions under the Global Magnitsky Act. A few days later, his Facebook and Instagram accounts disappeared, seemingly in response to the sanctions. His tweet raised an interesting question: Why did Facebook and Instagram, which is owned by Facebook, ban Kadyrov, but Twitter didn’t? Facebook confirmed to Foreign Policy that Kadyrov was indeed banned because of American sanctions against him but wouldn’t elaborate on what aspects of the U.S. sanctions regime require the company to boot individuals from its platform. Once accounts for individuals on OFAC’s list of “specially designated nationals” are identified, Facebook, according to the representative, has a legal obligation to take action. But the law might not be quite as clear as that. Peter Harrell, a fellow with the Center for a New American Security who developed sanctions at the State Department during the Barack Obama administration, explains that the difference might come down to something called the Berman Amendment. The Berman Amendment, Harrell says, is an amendment to the International Emergency Economic Powers Act, or IEEPA, that states nothing in that law can be used to constrain publication. “If you have a sanctions designation based on IEEPA, it’s very clear that that cannot be used to prohibit publication activities,” Harrell says. The United States has, for example, leveled sanctions against Venezuela under IEEPA, but per the Berman Amendment, Venezuelan President Nicolás Maduro couldn’t be kicked off Facebook — at least not over sanctions. The Berman Amendment applies only to IEEPA sanctions and not other sanctions programs, such as the separate legal provisions outlining the Global Magnitsky Act. “There is a legal argument that because Kadyrov was sanctioned under Magnitsky, rather than under IEEPA sanctions, the Berman Amendment does not apply,” Harrell says, meaning the U.S. government could conceivably sue Facebook to force Kadyrov’s removal, a risk the company may have not wanted to take. So why did Twitter let Kadyrov remain on its platform? Twitter declined to comment on its reasoning, but Harrell suspects that because the Berman Amendment “reflects underlying First Amendment-type interest,” courts could decide that even if someone was sanctioned under the Global Magnitsky Act, he or she can’t be prevented from publishing in the United States. The “vaunted democracy” and “right of citizens to receive information” that Kadyrov asked for, then, were right where the question was posed — on Twitter. Asked to comment on Kadyrov’s removal from Facebook and Instagram, a spokesperson for the Russian Embassy in Washington raised a different issue. “It’s rather stunning, but the following fake account still exists,” the spokesperson said — and linked to the Facebook page for a Soviet Embassy in Czechoslovakia.